After my 2014 iteration appears to have shown some level of predictive power at the tails, it is worth examining which guards and wings have created their own shot at the rim the best. Using hoop-math.com’s splits, I take unassisted rim FG in the half-court minus putbacks to approximate who had the most frequent success of slashing through a set defense and finishing. This could also include post-ups and the splits are at the whim of NCAA play by play keepers, so this should not be treated as gospel. But it is an interesting perspective that can illuminate why an otherwise weak prospect like Jordan Clarkson might have value to NBA teams. I am splitting up the sample into point guards and wings since I found last season that point guards tend to get to the rim more often since they have greater ball handling responsibility. Olivier Hanlan leads the pack, and this might be a hint that he is worth a mid-late 2nd round flier. Delon Wright is the real winner of this analysis in my mind. Not that his grade is exceptional, but I perceived him as a player who would struggle to create against superior defenses since he is neither a high usage scorer nor is he a great athlete. But this suggests he has more slither than I had credited him for in my mind, and with his length, sharp instincts, and stellar NCAA production he may be the hidden gem of the draft. Kris Dunn and Jerian Grant are right around where I expected them to be. If anything I am slightly disappointed that neither showed much more slashing potential than expected. I showed Cameron Payne’s freshman and sophomore split to display how wonky a single season sample can be. Payne actually showed large upticks in his two point volume and efficiency from freshman to sophomore season, yet fell off a cliff with respect to this specific split. Perhaps the Murray State play by play keeper became much more stingier with the definition of a rim attempt, as Murray State went from 42% rim, 22.6% mid-range splits to 34.9% rim, 31.4% mid-range splits with almost entirely the same roster. Payne does throw up a bunch of short range floaters so it would stand to reason that he would have a number of FG’s on the border between rim and non-rim attempts. Either way this is a bit of a red flag, he is a sophomore playing in the Ohio Valley Conference and probably will not be a lock down defensive player in the pros. And even if he gets to the rim in the NBA, he may not have the size or athleticism to consistently finish. This is a friendly reminder to not get too carried away with the mid-major sweetheart as draft sleeper. D’Angelo Russell’s split is a big disappointment, and the only major red flag in his draft profile. He is only a freshman, and he does appear to have the handle and shake to become a decent slasher in the NBA. But perhaps this is a sign that his lack of burst outweighs his shifty ways, and that he will struggle to create rim attempts the same way that James Harden does. Harden overcomes his lack of burst with an elite euro-step, and if Russell is only decent at stepping through the defense he may be a big disappointment. Perhaps this stat is a fluke, or maybe Russell overcomes it as he adds bulk and continues to polish his skill set. He still does have a stellar skill package and this is not necessarily reason to disregard that. But it explains his shaky splits vs. good competition and it prevents him from being a guaranteed stud like Karl Towns and Justise Winslow. Tyus Jones also has a disappointing split. He is a freshman projected to go in the mid-late 1st round, so this is not quite cause to firesale his draft equity. But it is worth pondering what his edge will be over the other talented PG’s in the NBA as a small jump shooting PG. Terry Rozier’s splits show why I do not perceive him to be much of a prospect. He is 6’2″, just turned 21, and is below average at slashing, passing, and shooting. At best he is a late 2nd round pick. Andrew Harrison is not an NBA caliber basketball player. Not much new to see here. He would be a waste of a draft pick. Norman Powell and Dez Wells stand out as possible round 2 sleepers as both are toolsy wings who may be solid roleplayers with some 3 point shooting upticks. Powell is especially intriguing as he is a great athlete who measured to have a monster 6’11” wingspan 5 years ago. I called Sam Dekker a boring prospect, but this is one area where he stands out. He has the athleticism and handle to get to the rim, and the size to finish over anybody. I am warming up to him after seeing him beat Willie Cauley-Stein off the dribble and finish over him, which is something that happens approximately never. Rashad Vaughn continues to strengthen my belief that he is an underrated one and done due to playing for arguably the worst NCAA coach in Dave Rice. He can probably get buckets at the NBA level, and it’s only a matter of gambling on his BBIQ and feel developing into a complete player. The latter is not likely to come to fruition, but in the late 1st it is worth a shot. Justise Winslow grades out extremely well for a freshman SF who was alleged to lack creation skills. His explosiveness paired with a nice euro-step gives him sneaky upside as a slasher, especially if he continues to polish his handle and finishing ability. His draft profile is completely loaded with green flags, and he is at worst my #2 prospect in the draft behind Karl Towns. Stanley Johnson does not assuage my creation concerns for him with his score, as some of his buckets could even be from post-ups. But Kelly Oubre ranks even worse, which throws cold water on my affinity for him as a sleeper, even though I knew that he does not have much shake in his game. Devin Booker did not get much ball handling responsibility sharing the floor with the Harrisons and Tyler Ulis, but this is a red flag nevertheless. He has solid 2p% statistics but it is not because of his ability to create for himself. Without athleticism, length, defense, rebounding, or creation I simply do not see how he is worth a look in the lottery. Stanley Johnson vs. Kelly Oubre: Who is the #2 NCAA SF? Stanley is 6 months younger, played more minutes per game (28.4 vs 21.0) and did so for a better team with a better defense. RSCI ranked Stanley #3 and Oubre #8, DX has Stanley 9th and Oubre 13th in the 2015 draft, ESPN has Stanley 11th and Oubre 12th, and Layne Vashro’s EWP grades Stanley (8.4) comfortably ahead of Oubre (5.4). All macro signs point toward Stanley Johnson having a small but clear edge as a prospect. But details are fun and occasionally illuminating, so let’s explore them before ending the article in agreement with consensus. The biggest difference between the two players comes in their physical profiles. Stanley measured half an inch taller and 33 pounds heavier than Oubre at the Nike Hoop Summit, and has a big edge in physical strength. Oubre counters with go go gadget arms (7’2″ vs 6’11” wingspan), superior athleticism, and vastly superior quickness. Overall Oubre has a much more attractive physical package. While Stanley’s tools are not bad, they come with the red flag that average athletes with excellent strength often struggle to translate their NCAA production to the NBA. Stanley Johnson somewhat reminisces of a SF version of Marcus Smart, minus the part where he is a defensive outlier. Johnson doesn’t have Smart’s defensive quickness as he gets beaten off the dribble much more frequently, and while he has a good steal rate (3.3%) it pales in comparison to Smart’s outlier rate (5.2%). And in spite of being 4 inches taller he somehow has a lower block rate at 1.6% vs 2.1%. As an NBA rookie, Smart has been an adequate floor spacer and passer, but has largely failed to get to the rim and finish or draw free throws off the dribble. As much as I love Smart, he would be a bland prospect without his awesome defense. Stanley gets flack for his rim finishing, and rightfully so as his half-court splits are particularly ugly. It’s staggering that he is worse on half-court rim attempts than he is on non-rim attempts. For comparison, Marcus Smart shot 37/71 (52.1%) on half-court rim attempts as a freshman and 60/94 (63.8%) as a sophomore. Given Johnson’s size advantage, it is extremely disconcerting how badly he is struggling. This is slightly softened by his impressive half-court mid-range splits where Smart only converted 32.6% in his 2 years combined. So at least he may not be a complete zero inside the arc once he transitions to the NBA, but a good floater is a weak go to weapon in the NBA. It is a good plan B for the occasions when he can’t get all the way to the rim, but if he cannot get there ever and it becomes plan A then it does little to bolster his value. Kelly Oubre has little in the way of a half court skill set, but in spite of his greater athleticism he is less reliant on transition scoring and his half-court splits are a bit stronger. Further troubling for Johnson is that Arizona only faced 11 of 38 opponents featuring top 100 defensive 2p% and top 120 blk%. In those 11 games, Johnson shot an appalling 23/88 (26.1%) inside the arc. Given his volume of mid-range attempts, the sample is likely hurt by bad variance. But it logically follows that floaters and short jumpers are less likely to be converted when contested by length, and his rim woes are obviously exacerbated in such matchups. In comparison, Kansas faced 17 of 36 opponents who fit those parameters and Oubre converted 33/72 (45.8%) of his 2PA in slightly more total minutes than Stanley (362 vs 347). And in spite of fewer 2PA, Oubre drew more FTA in the sample 82 vs. 68. Also Oubre played 3 games against by far the top 2 interior defenses (Kentucky and Texas) where he collectively shot 8/14 from 2 with 13 FTA in 66 minutes. No matter how you slice it Stanley’s statistics suffered significantly more against defenses that most closely approximate NBA caliber competition. This aligns with the narrative that he is a greater translation risk than Oubre. Oubre does not have a sophisticated offensive game, as his creation skills are limited and he projects to be little more than a floor spacer early in his NBA career. But he shows flashes of ability to drive and finish that are absent from Stanley’s repertoire, and with his superior athletic package he may be able to build on this as he ages. Stanley is a better passer with a better floater, but there is no clear path where he surprises as a quality NBA scorer. Paul Pierce became an NBA superstar with average athleticism, but he had elite feel, handles, and footwork and as of right now Stanley does not shine in any of the three categories. So unless he progresses his skill level tremendously in the next few years, he likely will be limited to being an offensive role player. Both have great rebound and steal rates, and both have surprisingly low block rates. I believe that Oubre’s block rate is a bit of a fluke– he did not accrue a single block in his first 229 minutes while he was trying to solidify his role in Kansas’s rotation, and he ended up with a smaller sample of minutes than most lottery prospects. I suspect that his block rate would grow with a greater minute sample. Conversely this may indicate that his leaping ability pales in comparison to his stellar lateral quickness, and I could be overrating his athleticism advantage over Stanley. Either way I favor him as a defensive prospect because he is drastically tougher to beat off the dribble, and should have a much easier time guarding NBA SF’s. This is partially offset by his mediocre defensive awareness as he is sometimes prone to lapses, but his upside as a defensive wing is elite whereas Stanley is a mixed bag. To narrow the gap, Stanley has equity to be a good defensive PF in the NBA once paired with a good rim protecting center. He rebounds well, he has enough strength to hold his own in the post, and he has quick hands to poke away entry passes. Further he might be perceived as a weak link in the defense when facing a slightly taller post-up PF, and less sharp coaches might try too hard to attack the “mismatch” and run highly inefficient post-ups against him. Even though he will likely struggle to contain quicker SF’s off the dribble, Stanley still could easily end up as a positive defensive NBA player. It would not surprise me if he became something along the lines of Draymond Green as a pro. In spite of all of the red flags, his stellar production at such a young age cannot be completely ignored and I maintain him as a clear lottery pick. Oubre has a different flavor of red flags. He could barely get off the bench early in the season because he was so lost, and once he secured a starting role his inconsistency still resulted in a number of games where his minutes were limited with near empty stat lines. He does not have good feel for the game, as he would at times blindly barrel his way into the lane and get blocked or turn it over. He also has a mediocre assist to turnover ratio and questionable defensive focus. He is still learning how to play and I do not perceive him as a lock to become a good NBA player. But these flaws can partially be attributed to being an inexperienced freshman (Stanley was not immune to similar errors), and I feel that Bill Self was a bit overreactive in jerking his minutes around. And in spite of his warts, his bottom line looks good. He comfortably led the #10 kenpom defense in individual DRtg as a SF, he posted an above average ORtg on 23 usage, and his production did not drastically slip against the many stingy defenses Kansas faced. His flags are less worrying to me than those of Stanley, and I am more enchanted by his upside. 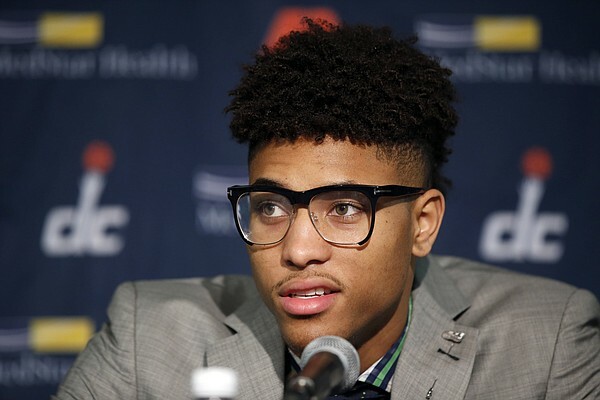 I do not prefer Oubre by a landslide, but I clearly favor him as a prospect. Oubre’s warts are enough to keep him outside of the top 4 conversation, but after that I gravitate toward him being the 5th best prospect in the class. He fits easily into NBA lineups as a 3 + D wing. He offers defensive versatility, as he has the quickness to guard SG’s and the height and length to play as a small PF, especially once he adds strength. Perhaps his basketball IQ and skill level never develop enough to become more than a mediocre 3 + D player, but I like enough about him to roll the dice on him falling somewhere on the spectrum of a quality 3 + D guy to all-star caliber.